contradictions are something of a standard fitment these days. a son who says he wants to get fitter, yet his mountain bike remains in the bikeshed untouched and unloved; a five pence reduction in the duty on petrol for the highlands and islands, except the cost of the fuel goes up by around seven pence; those darned southerners moaning about the hospepipe band, yet complaining that they've had heavy rain for several days. i'm sure, with a little effort, you could find more than a few of your own. while enlightening my once weekly digital photography class as to the effect that contrast may have upon their imagery, i introduced the colour wheel, a colour basic that i learned at school in the art department, and one that was consequently reinforced during my years at art college. the colour wheel is a passive icon; it worries not about the psychological effects colour may have when applied to an object or image, content with merely displaying diametrical opposites which, in perhaps a blatant example of contradiction, are known as complementary colours, despite their being anything but. i'd be inclined to infer that complementary colours were those that sit well with each other, the very ones that would be chosen to paint the sitting room. that, however, is decidedly not so, for black and white are the most basic of complementaries, sliding to the depths with blue and orange, red and green... i'm sure even the least interested amongst you have begun to get the picture (no pun intended). clever observation of the natural occurrence of colours in these combinations can, in certain circumstances, provide an appropriate level of tension in subsequent photographs. as a for instance, imagine a winter landscape with a heavy frost visible in the foreground, engendering blue shadows, framed by a background of winter bushes displaying that terracotta shade that some inherit at that time of year. reds are regarded as warm colours and are thus perceived as pushing to the front. blues, as a rule, inhabit the colder end of the spectrum, tending to recede. this can be seen most dramatically when viewing distant hills or mountains which acquire a bluish hue indicating to our eyes that they are somewhat distant and unlikely to slap us in the face anytime soon. it's the natural order of things. reversing this seems contradictory, yet can happen in real life as opposed to the artistic. you therefore have to wonder what the folks at perren street had in mind when introducing tins of summer embrocation to our legs to have them smell of the ventoux during the months of endless summer (a little hebridean humour there). for is the stated purpose of embrocation not to excite the blood vessels just under the skin of those gnarled, rough hewn calves and shins? throwing caution to the wind come the winter months, rumbling across less than billiard flat roads in wind, rain, ice, hail and snow, calls for more than just appropriate clothing and coffee that leans ever so slightly towards the hot end of the milk frother, and embrocation is that added extra. 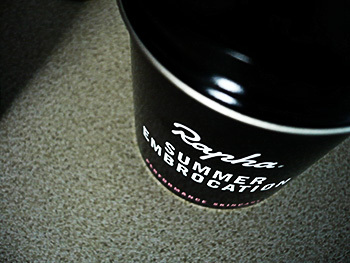 being extremely careful to rub on chamois cream before taking the top off the tin of embrocation, it is customary to slather the lower limbs with the bright orange of rapha's winter embrocation. the general consensus is that so doing postpones the necessity to wear that pain and suffering in the opening kilometres, simply to coax the thighs of steel into some form of excited action. 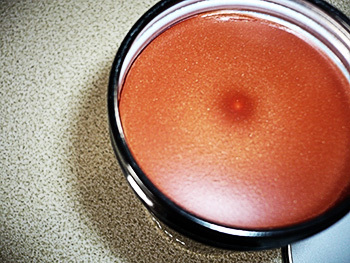 once cruising speed and altitude have been attained, the orange cream has less work to do, but in case of conditions preventing the build-up of a suitable head of steam, the cream continues to carry out its purpose in life for more hours than could be reasonably demanded. however, this is summer time. i know this because rapha have introduced their spring/summer range, and they would never do this unknowingly (would they?). and in any case, it is sunny outside and has been for many a day (apart from possibly last sunday morning). though we have no hosepipe ban in place, it hasn't rained too often since the beginning of april. that counts as summer, particularly when may is but a few days distant (it still inhabits a bluish hue), but the question that remains unanswered is why it should be thought necessary to provide an embrocation for the forthcoming months? possibly, if my visits to the big smoke are anything to go by, it's a product that will see little other than cosmetic use in the extreme south of the border. however, sun in the sky round these here parts does not equal in ancrease in ambient heat. that glowing orb is, i hate to point out, around 93 million miles away, and the gap in between is that of a very cold vacuum. thus, the past week, though demanding strongly tinted rudy projects, has also necessitated a long-sleeve baselayer and short sleeve cross jersey under that pro team jacket (the ever so stylish black version), bib threequarters and long-fingered gloves. could this be the very opportunity to slather my exposed skin with the dark brown embrocation that smells sweetly of mont ventoux? 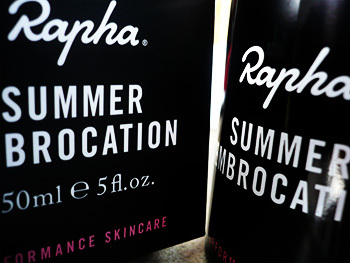 and so it is that i have ridden the highways and byways through insufferable windchill (not quite, but it adds a level of drama to the review) comforted and protected by rapha's summer embrocation. visibly, i cannot attest to the hue of bertie the accountant being the hoped for by-product, and in use the only indicator is a fine film of grime adhering below the silicon grippers. however, it does appear to accomplish that which is stated on the tin. the summer embrocation does not engender the same buzz as its more orange winter counterpart, but then that's hardly the point. the watchword is tingle; not one that in any way irritates (perish the thought), but did help greatly in the face of chilling adversity. i cannot admit to being a cyclist who regularly applies such products, mostly due to memory lapse i'm afraid, but in the light of how well this recipe fares on wobbly legs, i may leave the tin beside the day's cycling apparel for more regular application. i respectfully suggest you try the same; it is the flandrian/hebridean/continental way. posted saturday 28 april 2012.